We here at SolidBox value productivity above all in our applications and of course, our hardware. Each week, we’ll be giving you a tip to help you enhance your productivity with SolidWorks specifically. Sorry, we can’t help you with the hours you spend on Youtube each week watching cat videos. Nonetheless, hopefully you can learn something to make your SolidWorks experience easier. This week we’ll talk about FloXpress in SolidWorks 2013. SolidWorks Premium is in most cases an investment worth making. With additional functionality and an entire toolbox full of amazing add-ons, we love SolidWorks Premium. However, luckily, if SolidWorks Premium proves to be cost prohibitive, SolidWorks Standard has begun to include quite a few tools that have trickled down from Premium. One such tool is the FloXpress tool. 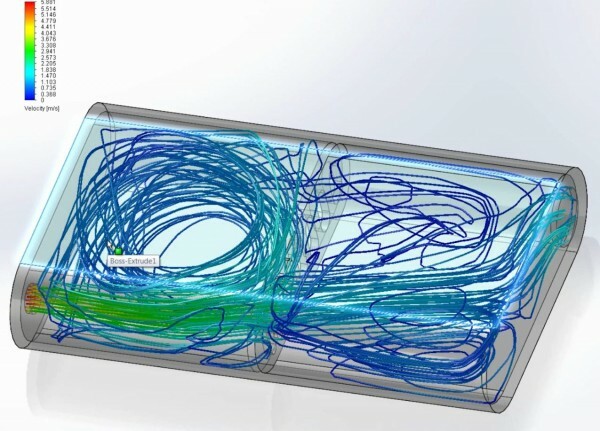 Although not as robust as the tools in SolidWorks Simulation (found in SolidWorks Premiere), the FloXpress tool is nonetheless a helpful tool for a top-level flow analysis. This video shows you how to utilize the FloXpress tool found in SolidWorks Standard.